Herbert Read, The Green Child, New Directions, 1935. "Herbert Read was an English poet, writer, philosophical anarchist and pacifist during the first world war. He published more than 100 books and essays, and as an early 20th-century critic was one of the first interpreters of contemporary art. 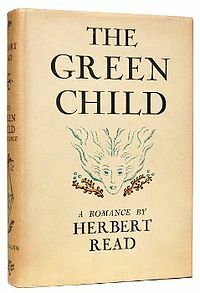 His only work of fiction, The Green Child, was published in 1935 and defies easy classification. Non-linear in structure, it is divided into three parts, each distinct enough to be its own book. All three parts end with the suggested death of Olivero, the protagonist, symbolising his passing into another realm of life, or consciousness. In the first part, Olivero (president of an unnamed South American country) returns to the English village of his childhood. All is unchanged, except for the stream, which now appears to run uphill. He follows it up to its mouth, where he discovers a woman being tortured by a sadistic husband; from her skin colour, he recognises her as one of two "green children" who had turned up in the village on the day he left. He secures her release and she leads him below the surface of the water, into the labyrinth of her lost people. The second part is a memoir of Olivero's adventures in South America – his imprisonment, political ascension and subsequent stagnation of his leadership, prompting him to fake his own death. The third part explores the subterranean Utopia into which Olivero and the green child descend. In this world, time and reality are replaced by four "ledges" of meaning. The highest is meditation, and Olivero begins to prepare his body (once more) for death. The assassination of President Olivero, which took place in the autumn of 1861, was for the world at large one of those innumerable incidents of a violent nature which characterise the politics of the South American continent. For twenty-four hours it loomed large in the headlines of the newspapers, but beyond an insinuation, the next day, that General Iturbide had formed a provisional government with the full approval of the military party, the event had no further reverberations in the outer world. President Olivero, who had arranged his own assassination, made his way in a leisurely fashion to Europe. On the way he allowed his beard to grow. I really wasn’t sure after that opening paragraph. Nicely written, but an Englishman rising to power in a South American country, faking his own assassination and returning to England? But I’m afraid I know little about South American politics that I haven’t learned through fiction. Maybe it happened, maybe it could have happened, I really don’t know. - Graham Green provided a fulsome introduction. Not necessarily a sign that this would be the book for me, but definitely a sign of quality. - Capuchin Classics, who have a lovely list full of books that I have either loved or aspire too, saw fit to reissue The Green Child earlier this year. He follows the stream to a mill, where he finds a pale and fragile woman held captive by a brutish man. Olivero is drawn to the woman, recognising as the subject of many local tales. The Green Child. Olivero rescues the Green Child from her captor and tells her his story. And it is here that the story takes a sharp turn – from a lovely fanciful country tale to a gentle political satire. The young Olivero set out from his home to seek his fortune and, almost passively, travelled along a very strange road from messenger boy to dictator. Fanciful in a very different way. It was readable, but I read hoping that it wouldn’t be too long before the older Olivero and the Green Child reappeared. And eventually they did. The Green Child drew Olivero into her own world below the mill-pond. Both are welcomed into the community, where life is ordered around a progression : from the pleasures of youth, through the pleasure of work , through the pleasure of opinion and argument, to the final pleasure of solitary thought. And so I found myself in a dystopian tale. Olivero makes his journey towards what he comes to realise he had always been seeking, and eventually to the end of his life, when he is absorbed into the rocks that form the foundation of the world. A very different kind of strange. And not my kind of strange I’m afraid. The Green Child is a novel in three very different acts. And for me, although there was some lovely writing and much food for thought, the book didn’t come together as a whole. Maybe a little more background knowlege would have helped. Widely debated when it came out more than a generation ago, The Green Child is truly a masterpiece, a rare blend of fantasy and reality. I said that Read had only written one novel, and in a way that's true - but he certainly made up for it with The Green Child. Although under 200 pages in length, the three parts of the book are essentially three different novels. The same story runs through them, and the same central character of Olivero, but the feel and style differs so dramatically that it's unlikely you'll react the same way to each section. It was then that he noticed, or thought he noticed, an extraordinary fact. The stream as he remembered it – and he could remember the pressure of its current against his bare legs as he waded among its smooth, flat pebbles – ran in the direction of the station from which he had just come. But now, indubitably, it was flowing in the opposite direction, towards the church. With a cry of happiness, as if a secret joy had suddenly been revealed to him, he raced forward, and hand in hand they sank below the surface of the pool. And that's the last we hear of them for a bit, because Part Two is all the back story of Olivero's life. I'd wondered why they bothered making him an ex-President, and now I see why - we follow him through his political ascension and... well, to be honest, I skim-read quite a lot of this section. To be frank, I found it really dull. I don't think novels should include huge chunks of 'and this is what had happened beforehand' (analepsis, is that?) because it's difficult to be interested. And combine that with political stuff... well, if you're interested in political novels, then this section might work for you - but I'd just got really interested in the first section, so was frustrated when we were diverted off track. It's the diary section of The Tenant of Wildfell Hall all over again. Fast forward ninety pages or so, and we're onto Part Three: they're in the underground world from whence the Green Child came, and they're exploring. This section has most in common with utopia literature like Francis Bacon's The New Atlantis and, indeed, Thomas More's Utopia. It would make really interesting reading alongside, especially the former. We've moved from fantasy-in-the-real-world to fantasy-in-a-fantasy-world where, for instance, there is no concept of time. I wonder what J.W. Dunne would have to say about that? So there you go. One short novel; three genres. The first of them was my favourite, and I did rather wish that The Green Child had continued entirely in that vein. While the third section was interesting, it felt more like the set-up to a different novel. And, as mentioned before, the second section was very much not my cup of tea. And perhaps that's the problem with the novel - I can't imagine anybody loving each 'genre' equally? Surely you'll want more politics and less fantasy, or vice versa, and so forth?